The blended learning programme offers a methodical approach to the development of digital marketing skills by utilising an online portfolio support system allowing candidates to work at their own pace, at the most convenient time and location for themselves. This system also encourages online communication between candidates encouraging the exchange of good practice between professionals. All online programmes are supported by tutorials and coaching. The qualification modules include: understanding the business environment; understanding legal, regulatory and ethical requirements in sales or marketing; search engine marketing; using collaborative technologies; digital marketing metrics and analytics; content marketing; image and video creation, principles of social media within a business and much more…. You can view a full list of modules (both mandatory, and optional) via the SQA website here. A full training needs analysis will be carried out with both the employer and the candidate prior to acceptance on the programme. 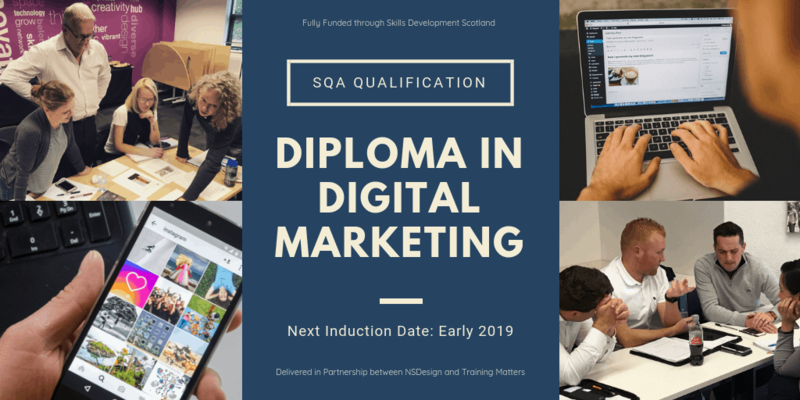 Given the priority that the Scottish Government are putting on the need to develop digital marketing skills, this programme is fully funded for all eligible participants through the Skills Development Scotland Modern Apprenticeship programme, and as such (with the exception of a small admin/registration fee) the Diploma in Digital Marketing will cost the candidate, and their employer – nothing! Get in touch with Gary Ennis, Qualified trainer and lead coach on the diploma, and he’ll walk you through any questions, discuss suitability for the candidate, and explain the next steps to move forward with the programme. Our next induction date (for new candidates) is likely to be summer 2019.